Flat Design is the Face of the Future | What Is Flat Design? Flat design is a design philosophy based on simplicity, minimalism, and clarity in graphical user interfaces. Advocates favor substance over style and reject elaborate embellishments like shadows, dimensions, gradients, and textures. Flat design complements the strengths of digital interfaces, rather than restricting users to the limits of the analog world. The resulting “flat” pages communicate with users via parallax scrolling and visual simplicity. Gizmodo provided a thorough overview to explain why flat is the face of the interface in the future. Flat design is currently being used to great effect in Google Now, which displays data on a standard-sized card inside of static icons. The design makes the data much easier to read and remove from view. 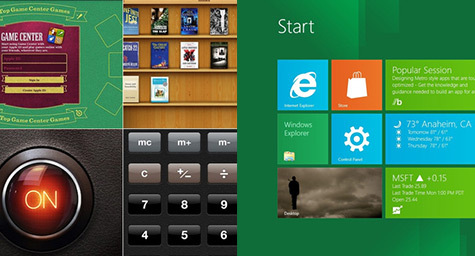 Windows 8 is also employing flat design to help users understand the content without the distraction of the context. This “flat” philosophy began as a reaction to the problems of skeuomorphic design. Skeuomorphism is basically visual deception where details and embellishments are used to make one thing look like another. Real-world examples include faux facades in architecture and fake wood paneling in car design. In UI design, skeuomorphism is commonly seen in digital elements that resemble things from daily life, such as the “pinboards” on Pinterest. Skeuomorphism in digital design was first used in the early 1980s as a way to help familiarize users with the foreign concept of computer interfaces. It was actually a valuable tool because it let designers create visual metaphors between common objects like office file folders and brand-new elements like digital files. As computers became common, those visual metaphors proved unnecessary and skeuomorphism only caused distraction and disruption. This led to a backlash that inspired a new generation of designers to go to the opposite extreme of stark simplicity. They eliminated the fanciful details that had no affect on functionality and instead focused on clarity and integrity in design. The result was a modern, minimal look that emphasized function over form. While flat design is the look of the moment, the future is likely to bring a whole new aesthetic. Historically, each era of modernism has rejected the status quo and brought in brand-new concepts of design. This pattern is bound to repeat in the coming years as design and technology evolve with our lives. Keep up with the latest trends in digital design. Contact Contact MDG Advertising today at 561-338-7797 or visit mdgadvertising.com.